When you want to impress that special someone, send this extraordinary mix of premium flowers and the recipient will know exactly how you feel, without exception. 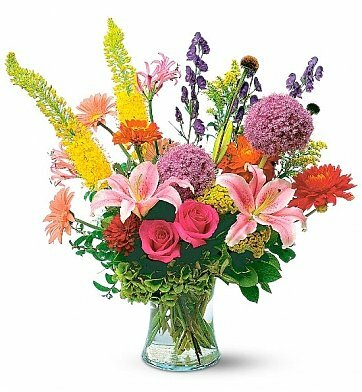 The magnificent and varied bouquet includes rare flowers such as allium, dahlias, gerberas, eremurus, rudbeckia, and roses, all within a gorgeous clear glass vase. The rich color and fragrance of the many flower varieties make this large bouquet a sheer delight to the senses. Hot Pink Roses (50 cm). Assorted Lush Greenery and much more. Measures approximately 23" x 34". Deluxe Garden Blooms is a hand delivered gift. These gifts are delivered by one of our local design centers located throughout the United States and Canada. Same day delivery is available for most gifts when ordered before the cutoff time. The cutoff time for Deluxe Garden Blooms is 2 PM in the recipient's time zone. The flowers were sent as an expression of sympathy and were delivered the day after I ordered them to the correct address.